Cardiff nightspot, Tiger Tiger, welcomed popular celebrities to the launch of Kanaloa, a Polynesian themed bar with an extensive cocktail menu. Celebrities celebrated at two launch parties on Friday 10 and Saturday 11 August, with star DJs, live performances, giveaways and live entertainment including fire performers, Polynesian dancers and stilt walkers. On Friday Danny Jones from McFly headlined, with Pat Sharp, Lee Ryan from Blue and Capital FM’s Matt Lissack, while on Saturday Dane Bowers headlined, with Simon Webb from Blue, Ministry of Sound’s Sarah Louise and Glamorgan Cricket Club players also made an appearance. The cocktails at Kanaloa are set to be a hit with the city’s partygoers. Each one is designed by award-winning mixologists made with freshly squeezed juices, exotic fruits and primarily organic ingredients. Signature drinks include the Kanaloa Kula, a heady mixture of Mahiki Rum, Lemon, Star Anise, Lime Sugar, Pomegranate juice and Vintage Spanish Sparkling Wine. Kanaloa’s sharing cocktails include Octopus Punch, which serves eight people and features Eldorado 12 Guyanese Rum, Nui Nui Spiced Syrup, Fresh Lemon, and Black Tea served in a bespoke Octopus punch bowl. The bar’s interior reflects a relaxed summer atmosphere with carved wooden pillars, bamboo, and traditional tiki-styled areas alongside tropical leaf patterned walls and rustic wooden planking. The Kanaloa Kitchen will serve a range of special Pan Asian-inspired dishes such as Tempura Lobster with Wasabi Mayonnaise (£15), Salt and Chilli Baby Squid with Soy Sauce (£7) and Thai Green Chicken Broth with Sticky Rice (£10). 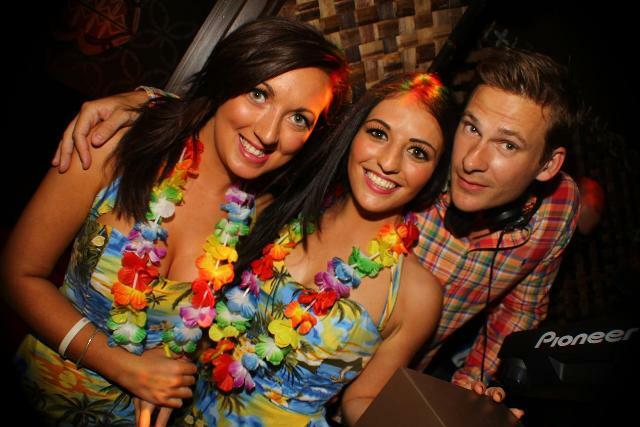 For more information about Kanaloa at Tiger Tiger Cardiff visit www.tigertiger-cardiff.co.uk/kanaloa or call 029 2039 1944.